Reading a selection of poems of Salvador Espriu (1913-1985), playwright, novelist and, above all, poet. He is considered one of the most important and relevant authors of Catalan literature. 2013 has been designated as ‘Any Espriu’ (Espriu Year) on the occasion of the first century of his birth, in 1913. Minimum contribution: please, note that we appreciate a minimum donation of US10$ per adult to cover the expenses of this event. Cosmos Club Dress Code: jackets and collared shirts are required for gentlemen; similar attire for ladies (no jeans, shorts, flip flops or tennis shoes). 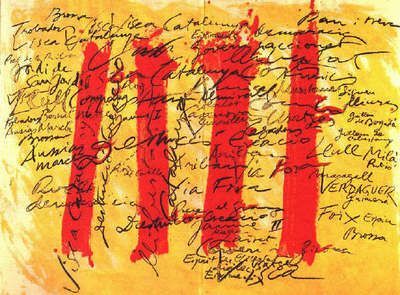 About the National Day of Catalonia: September 11th was selected for The Catalan National Day as it commemorates the 1714 Siege of Barcelona during the War of the Spanish Succession. Institutions and rights of the territories of the Crown of Aragon were abolished by the victorious Bourbon monarchy as punishment for their support to the claim of Habsburg Archduke Charles to the throne of Spain. In 1980, the restored Generalitat de Catalunya (Government of Catalonia), as its first public act, proclaimed September 11th as La Diada, the Catalan National holiday. Dress Code Policy: jackets and collared shirts are required for gentlemen (no ties from Memorial Day until Labor Day); similar attire for ladies (no jeans, shorts, flip flops or tennis shoes).